It’s no secret that I’m a huge fan of the Make Lounge and the latest workshop that I attended was no disappointment. Steven and I spent Sunday afternoon at their Jam and chutney making class, thanks to a birthday present of vouchers from Steven’s mum. The class covered the whole process of making jams and chutneys, and included lots of hints and tips on ingredients and equipment to use. We got to try our hands at making four different jams and chutneys: blackberry & apple jam, plum & orange jam, red onion chutney and a sweet chilli jam. They all taste absolutely delicious and, since both Steven and I both went, we have plenty of each for future consumption as well as the recipes so that we can make more when we finally run out. I’m almost disappointed that we have so much since it means there isn’t much point in us making any more any time soon. 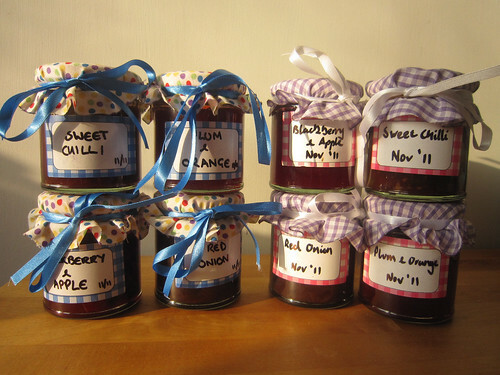 Although, I can think of a few people who might appreciate home-made chutney for Christmas! * I tried really hard to resist a pun in the post title, honest, but there are just so many jam-related puns that it was impossible not to use one. This entry was posted on Tuesday, November 15th, 2011 at 9:14 pm	and is filed under craft. You can follow any responses to this entry through the RSS 2.0 feed. You can leave a response, or trackback from your own site.